Last week on our podcast, we were delighted to be joined by children’s book author and illustrator, Ruby Roth, who told us all about her new book, V is for Vegan: The ABCs of Being Kind. Today, we welcome back to Our Hen House Katrina Donovan Fleming, who is giving us a candid review of this incredible new book. Place an elementary school teacher at a cocktail party, and you can bet your paycheck that someone will confess to her a desire to write children’s books. I know because I am that teacher, and I hear it a lot. Like any educator, I get a thrill when a new author breaks out into the world of children’s literature, inspiring young readers to stay up past bedtime, book and flashlight in hand. There tends to be an assumption, though, that writing for a young audience is comparatively easy. And while the writing part may, at first glance, seem more doable than meticulously planning out a dense novel, creating a book that appeals to children is something else altogether. There has to be that hard-to-define glow that draws kids back again and again, so that the pages become framed with grubby fingermarks and the spine begins to loosen from love like a worn teddy bear. And if you can simultaneously charm the adults as well? Well, you’ve just written yourself a bestseller. Ruby Roth, who was a guest on the Our Hen House podcast this past weekend, has, once again, created such a book. V is for Vegan: The ABCs of Being Kind is an alphabet book that, in her words, is “a rhyming prequel to That’s Why We Don’t Eat Animals and Vegan is Love.” It is aimed at younger readers than her previous works (3-7 years old), but kids of all ages will nevertheless be drawn to it – and likely some adults, too. As anyone with a child in their life knows, alphabet books aren’t what they used to be. Once upon a time, they were just a primer for learning one’s letters. Now they are a fun excuse to explore a given subject in twenty-six parts, sort of like a haiku, but longer. And for Ruby Roth, the subject is, as always, animals – and why we should be kind to them, and what that really means. While the number of animal-protection issues covered in this alphabet book is impressive, it never feels forced or overdone. Each letter is represented by one or two simple sentences that illuminate an idea. One of my favorite passages addresses a topic that occasionally divides some vegans. In it, a friendly bee hovers under a hive with the following rhyme: “Hh is for honey? That’s food for bees! Bees need their honey when temperatures freeze.” This simple statement addresses what can sometimes become a complicated argument, and it does so in a comprehensible and suddenly obvious way. Even I, a person known to think long and hard about animal issues, found my own reasoning clarified after reading it. Additionally, the pictures of the children represent all skin tones and body shapes, an often-overlooked prerequisite for allowing all kids to feel ownership over a story. They want to see people on the page that look like them. Indeed, in an era when girls still receive the message that skinny equals pretty and any other body type is ugly, it is refreshing to note Roth’s depiction of a little girl – her round belly protruding in the way that is common to healthy toddlers. 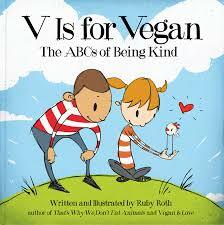 V is for Vegan is thoroughly charming, and would make a terrific gift for anyone, child or not. 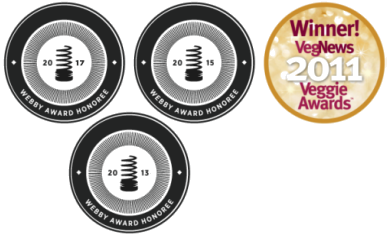 (Do you know someone with a “veganversary” approaching?) It turns the “angry vegan” stereotype on its head by showing that eschewing animal products is as kind and fulfilling an act as snuggling a kitty from an animal shelter. 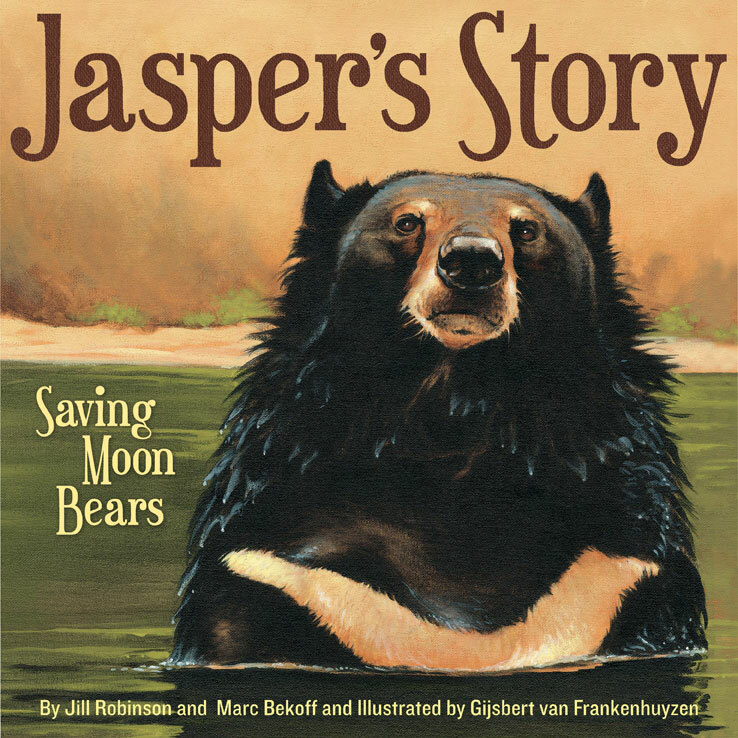 As for children, they will come away from this book empowered with concrete ways to keep animals safe from harm. 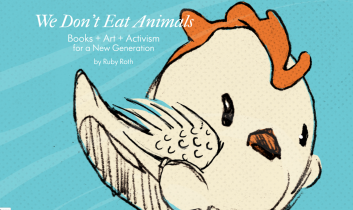 Ruby Roth manages to do what so many dream of: she’s created a treasure of a book that will appeal to the eyes, ears, and hearts of anyone who loves animals. It’s a keeper. 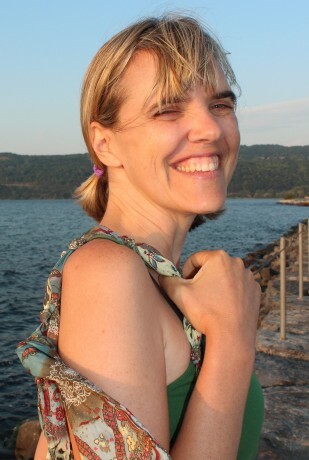 Katrina Donovan Fleming is a writer, teacher, artist, gardener, and returned Peace Corps volunteer who became vegan almost two years ago at the tender age of 40. She lives just outside of Boston with her husband and two cats, and writes a blog called Suburban Snow White, where she muses on creating and enjoying an animal-friendly life. She is also a regular contributor to Vegbooks. A professionally trained flutist, Katrina now dabbles in banjo, a development likely inspired by Kermit.